Make these small Cinnamon Rolls with Light Glaze for your next breakfast. They have the warm and comforting cinnamon flavor and a light sugar icing. The icing is just enough to add that little sweetness you need in the morning. 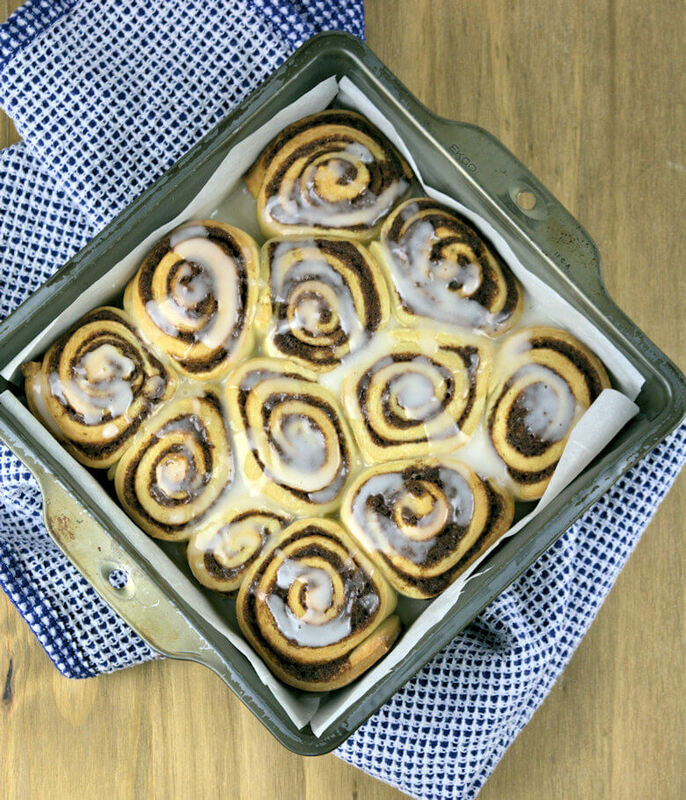 Cinnamon rolls in the morning is such a wonderful way to wake up. This is not my every day breakfast, you know what I am saying. Every now and then a little extra attention is needed especially after a night with very little sleep. A couple of nights ago, we were awakened about a dozen times. Heavy rain, thunder and lightning, right on top of us. The whole house was shaking, as if the heaven was coming down on us. In between these weather outbursts, a couple of coyotes were howling away as, if they were auditioning for a audience. The howling and high pitched screams or yips easily penetrate our bedroom, as they pass through the wooded area behind our house. I would love to know what they were saying; I could visualize them standing on that hill in the backyard, head thrown back and singing their song. I have the same with many animals; wishing that I could understand them. Would you not like to know what your dog or cat is thinking? When your dog turns on the puppy eyes or when your cat start blinking his eyes. I am sure that most of us know our pets pretty well, and know when they want their meals/snack, when they need to be cuddle or a back scratch or when they need to go out. But do we really know what they think or say when they bark, whine, meow, hiss or purr. I, for one, would love to know what goes on in those furry heads. So one morning, earlier this week, these cinnamon rolls did their job, as a picker-upper. We only had a few hours of sleep, so a little extra sugar to start the day with, was a good solution. Followed by the oh so necessary cups of coffee. I slightly adapted the recipe of these Cinnamon Rolls from Sommer Collier @A Spicy Perspective. I love this recipe, because of the way Sommer makes the filling. She mixes cinnamon and nutmeg with sugar and softened butter; a great way to spread the cinnamon filling evenly over the dough. My main adaptation was in the topping; I made a light sugar glaze instead of a cream cheese one. Cream cheese glazes are just a little too much for me; it almost masks the flavor of the cinnamon rolls. Make a dough from the ingredients listed below (milk, butter, sugar, flour, yeas, salt and an egg) and allow it to rise until double in volume. Punch down, roll, fold and turn and repeat this 2 more times. Then roll out to a 10 x 16 inch sheet of dough. Then spread the cinnamon filling onto the dough. Leave a strip on one long side uncovered, so when you finish rolling the dough the last side is dough to dough and not dough to filling as that won’t stick very well. 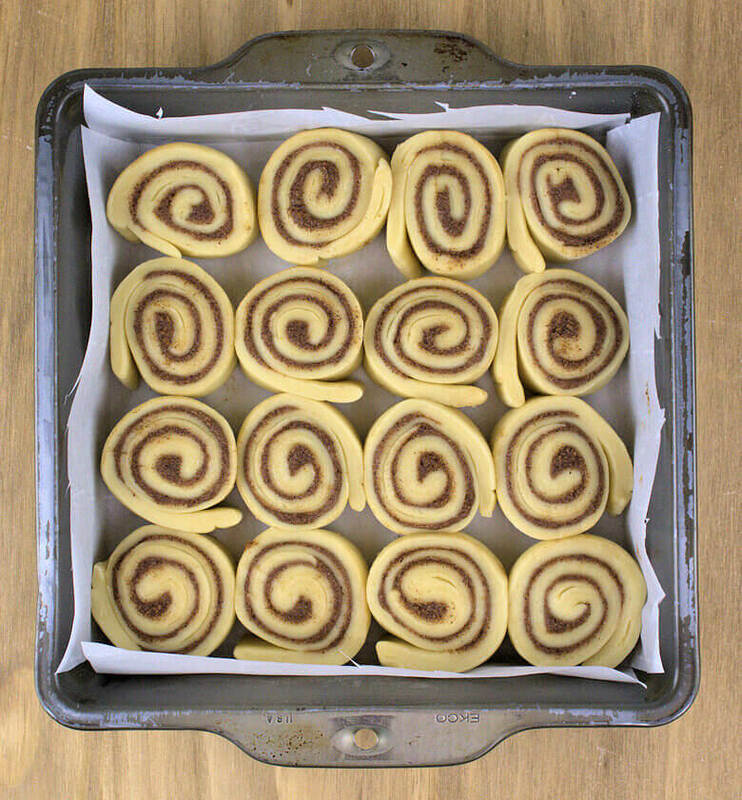 Cut the roll in 12 small cinnamon rolls. I prefer small rolls over thick rolls. If you do prefer the bigger ones, I would like to suggest that you roll the dough starting at the short side and then cut it into 6 pieces. In my opinion, smaller bites are more delicate, more flavor and even though the amount is the same, it feels different. You can of course double the recipe and you can have 12 thicker/normal cinnamon rolls, rolling again from the longer side. 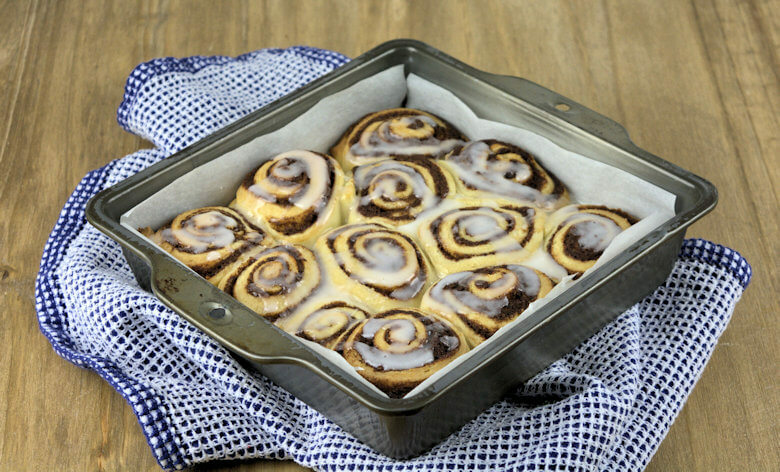 Place the cinnamon rolls in a baking sheet covered with parchment paper. Bake in a preheated 350 degrees F oven for about 20 minutes. It goes without saying that larger cinnamon rolls need to be baked longer. While these cinnamon rolls are baking, make the sugar icing by mixing confectioner’s sugar, milk and vanilla extract. Drizzle or pour the glaze over the cinnamon rolls after they are just slightly cooled. 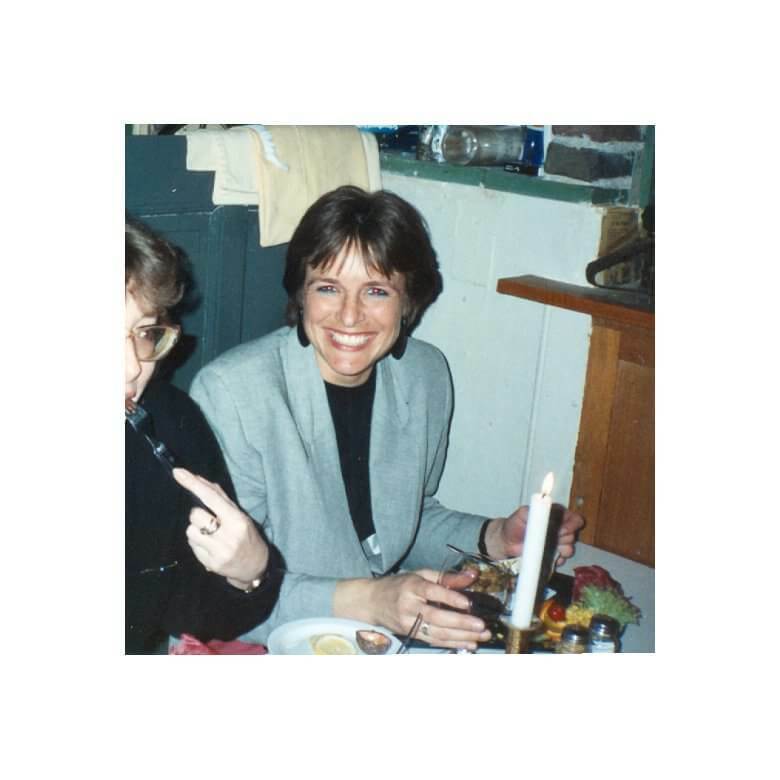 Divide the Cinnamon Rolls with Light Glaze over two plates, poor yourself a glass of juice and a cup of coffee and enjoy waking up. Make these small Cinnamon Rolls with Light Glaze for your next breakfast. They have the warm and comforting cinnamon flavor and a light sugar icing. The icing is just enough to add a little sweetness. All ingredients need to be at room temperature, especially the butter and the eggs. Cover a 9x9 baking dish with parchment paper. Bring the milk to a boil in a small saucepan and remove from heat. Add the sugar and the butter and allow the butter to melt. When the milk is cooled down to lukewarm, add the yeast, stir and wait 5-10 minutes until you see the surface of you milk mixture become frothy. In the meantime you can make the cinnamon filling by mixing the sugar, butter, cinnamon and nutmeg. Set it aside until you're ready to make the rolls. Punch the risen dough down and transfer to a floured work surface. Work it a few times, by folding and rolling, folding and rolling out. The final roll will be a rectangle of 16 x 10 inches. Spread the cinnamon filling over the dough. Leave about 1 inch uncovered on one long end. Now roll up the dough tightly, start at the long end that is covered with cinnamon filling, until you have a roll. Cut the roll in 12 equal rolls and place them in the baking dish. Allow them to rise for another 30 minutes (if you make them ahead, cover the baking dish with plastic wrap and place them in the fridge. Preheat an over to 350 degrees F and bake the cinnamon rolls for approx. 20 minutes. If you bake the rolls that were made a day earlier, please allow them to warm to room temperature before you place them in the oven. Make the glaze while the cinnamon rolls are baking, by mixing sugar, milk and vanilla extract. Take the cinnamon rolls out of the oven, allow to cool just a little bit and drizzle with the sugar glaze.